How do I describe him? If you were here, I bet the first thing that you’d say would be “Big.” Or note his super sized feet. The two year old son of the woman who raised Norman called him “bright.” And indeed, in his slick summer coat and highlighted hair, he shines. He glows. He has a halo about him. Although he is somewhat big, I think what we have here is a four legged angel. With furry wings on his feet. For those who have known me for at least a little while, you know a big part of our summers consists of heading to the high(er) country and “digging ditch” deep in the Weminuche Wilderness. Gizmo had been our faithful ditch digging companion for the past four years. But out of due respect, we decided it was time to allow him retirement. We’d rather let him enjoy his later years in style (Texas style, no less) than keep pushing and using and possibly wearing him down. Besides I love a challenge. That’s how I learn and grow. So here’s Norman. My newest challenge. A big horse for a little woman. A five year old Percheron/Belgium cross draft horse that I can tell you already has a similar heart of gold that Gizmo has. A heart as large as his big ol’ feet, and then some, maybe. Norman found us by way of a friend in Pennsylvania who saw an ad for a draft horse in Texas. Five years old and never been trained. But handled with love and kindness. That’s the foundation I look for. Forget those who are worried about “spoiling.” Just like with kids, kind and gentle care is the best I can ask for. No baggage, no fear, no worries about people and dogs, and when he sees you coming, he perks up and walks over to greet you. I’ll take “spoiled” any day, thank you. Not a lot of folks out there breeding, training and using draft horses. When it was time to look for a new draft horse to replace Gizmo, the most common recommendation we heard as we asked around was to ask the Amish. “Get an Amish trained draft horse,” we were told more than once. But since when am I going to do what I’m told? From what I saw last year, the first and only time we’ve seen the Amish and their stock make it high up this mountain horseback, I’ll stick with doing my own training. Before we even encountered this group we saw the tracks. Far bigger than Norman’s and the trail was just not built for a side by side team, though the tracks told us that’s what these horses were used to. Our trails are narrow, twisting, tight and fine. Not the best place for a really big horse, not to mention attempts at walking side by side. They just didn’t fit. So there we were, end of last summer, heading to another few days of digging ditch, riding up the trail in our usual silent smooth procession, looking down following these giant tracks, most of which are off the trail (“Trail? What’s a trail?” Not what a valley farm horse knows.). Lo and behold we meet a man, a frantic rider on a nervous horse. The horse is small, made for riding, but clearly not used to the mountains and elevation. He’s being pushed on, his eyes are wide, head high and tight, nostrils flaring, in full sweat, froth dripping from his chest, ears and between his legs, exhausted and clearly out of his element as he whinnied and pranced in place and carried on with the man on his back. “Have you seen a loose horse,” the man asked us as he tries to control his mount? No, and we point out to him that you could tell if you looked at the ground, there were no recent tracks in the soft trail heading down the mountain from where we came. Next we arrive at our camp only to find a Forest Service employee wondering if this was our camp… or the camp of the Amish that they could not find. We look across the valley and in the distance see a loose horse still running wild through the trees, another tied alone to a tree, we could hear his crying from over a half mile away, and a couple more going back and forth, containing the carnage. Then he told us of the Big Wreck. Now, I suppose many people starting out have wrecks. Packing is not as easy as it looks. And this was a doozie. World class wreck for high mountain horse packing. He tells of odd gear sprawled across the hillside, spilled open sleeping bags, the old fashioned kind you used in your backyard tent when you were a Boy Scout, and various pots and pans sprinkled all over the trail. He tells of horses running, gear flying, people yelling. And he tells us it was the worse of the wrecks he’d seen, and was in awe that so far, the horses made it through relatively unscathed. You know, if you place me behind a team out in the flats somewhere, you’d probably find a similar wreck. Out of my element. But for now, I’ll stick with the mountains. And mountain horses. Well, all this story does is show you why I was happy to find a draft horse that was NOT Amish trained, not too big, and just darned nice. Now, turning him into a skilled and seasoned mountain horse is our next adventure. Or at least, one of the many that we’re embarking on as the season progresses. Hi Gin…I’m Carrie’s mom, and Norman’s first human mom. I am so happy he is with you, and can’t wait to follow his progress. He truly does have a kind soul. The grandkids have sat on him, and he didn’t even flinch, barely blinked an eye. I’ll send you some baby pictures of him, and I might even have a short video. My brother is an accomplished packer, he and his wife have clocked many hours packing themselves into the Sierras, and for the Forest Service as well. They have had incredible stock, worth their weight in gold, and blessed without having a wreck over a period of many years. My almost four year old grandson in California cried when he found out Norman was no longer at Aunt Carrie’s house, so I’m sending your blog link so he can follow Norman. I know he will like that. Please keep up to date as your time allows, and thank you for already loving Norman as much as we do! Gay, I am thrilled to “meet” you and most grateful that you bred such a brilliant horse, and your daughter obviously cared much and well for him. I’m just back inside for a break after working two yearlings, with Norman reaching over the rail fence to actually lick their backs, while my puppy has taken up his own place in Norman’s generous shade while I work nearby. Training begins this afternoon, and I look forward to sharing his progress, and hope to make you and your family proud of this sweet hearted boy which I’m honored to have in our lives. 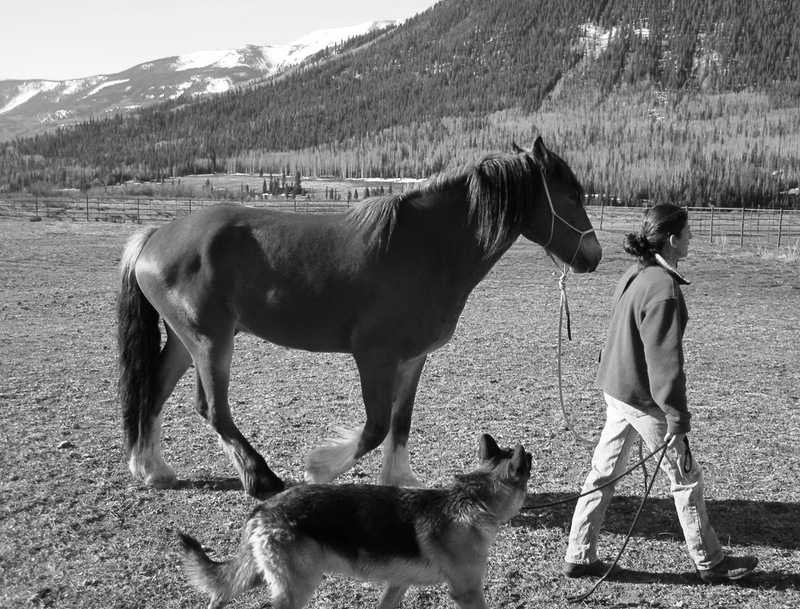 Norman’s mom was a rescue horse, from a Premarin ranch in Canada. She was pregnant with Norman when we adopted her. I’ll send you some pictures of her as well. You paint such a clear picture, I can easily envision the scene. Ah! So I can see where the heart of gold comes from, in two and four leggeds! Yes, I would so love to see baby pix, thank you, Gay. Can’t wait to meet Norman! I bet he is going to love being a working horse! I think he’ll love anything that involved being around people. He’s a sweetie. Cody will love him! Thank you, Kim, indeed it was. I hope for you as well, and all the mamas out there, of two and four leggeds. 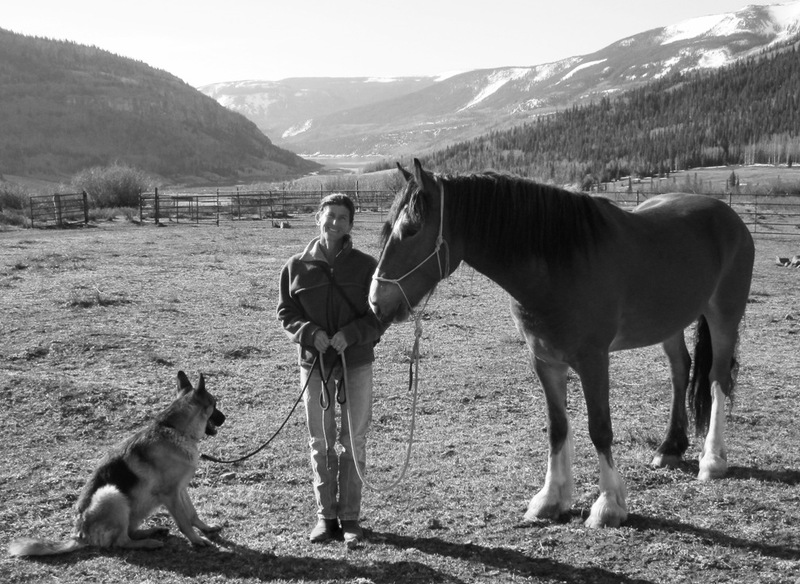 What a handsome fellow… makes me miss our old black Percheron, Eclipse. I don’t regret our choice to stop having horses here, but there is truly something beautiful and special in the heart of a draft horse! Glad you & Norman found each other! Maggie – I was just looking on line for harness for Norman, and thought I’d check in with you. Anyone up that way have any old harness for a small draft? My favorite is the New England D Ring harness and you can’t find that out west.